We all hold certain things sacred. Some more fervently than others. Religion and family of course are two big ones for some. The inexplicable need to dress up in public as a character from Star Trek among other losers...errrr, members of your peer group, is another. For me the cocktail, particularly classic cocktails, are not to be trifled with. When the martini craze was in full bloom I would shudder at the sight of something called a "Chocolate Martini". The "Appletini" would cause me no end of aggravation. The point being a Martini is two things: gin and dry vermouth. Anything else is a cocktail, not a fill-in-the-blank-"tini". And usually a cocktail that is best ignored. Perhaps my most revered cocktail is the Negroni, which like the martini is simplicity itself. Three ingredients instead of two: Campari, gin, and sweet vermouth in equal proportions. Even given its seemingly simple preparation, I've had some egregious examples. Any messing with the proportions throws the whole thing out of balance. Don't even start with changing ingredients. This all came to mind last Saturday when we went to Alba Osteria for dinner. On their cocktail list was something called a Negroni Sbagliato, which substituted prosecco for the gin. It was explained by our waiter as a negroni that is "lightened up". Once I got over my initial skepticism and considered it, it sounded quite good, even with the name "negroni" attached. So last night, in the interest of open-mindedness, and because a good cocktail seemed the perfect antidote to the day, I grabbed a bottle of prosecco off the shelf at VINO and made one. One sip and I was smitten! This really is a nice, rather than unfortunate, riff on a classic cocktail. So good that even adding negroni to the name seems to be not worth worrying about. Besides, if I do start to stress, what better way to calm myself than with another Negroni Sbagliato! 1-1/2 ounces each Campari, sweet vermouth, and prosecco. Fill cocktail shaker partway with ice, the amount depending on how many cocktails you are preparing. For my one drink, I used five cubes. Add Campari and sweet vermouth. Shake for 30 seconds, then strain into champagne flute. Add prosecco and stir gently to combine. Add garnish. Enjoy! 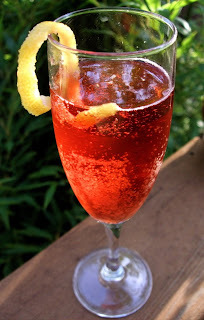 It seems like instead of thinking of this as a Negroni that is lightened up, you could think of this as an Americano which has been modified by replacing the soda with sparkling wine. Both the Negroni and the Americano are tasty cocktails, and it doesn't seem surprising that trying to come up with something in between them would result in something also tasty. You could also think of it as a spritz (campari/aperol + prosecco) with the pleasing addition of vermouth. Back when Kevin was still at PK he had the same drink on the menu, yet he called it a Champoni. Genius. andrew....very good point, then I can maintain the sanctity of the negroni in my mind! dp....that's what keeps us coming back for more, n'est pas? I respect you more since you are a Campari lover as well. Not everyone is. suzanne....not suprising that Kevin would be mixing one up. I also just heard of one now at Nostrana, also called the sbagliato.